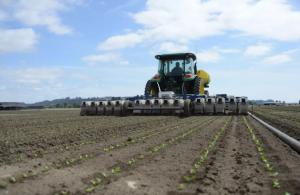 Just five months after ending a proposed deal to acquire the precision planting subsidiary of Monsanto, agricultural equipment behemoth Deere and Company has announced it will acquire agricultural tech startup Blue River Technology for $305 million. Blue River, founded in 2011, develops machine learning technology used for precision farming. Amongst its investors is Monsanto Growth Ventures, the venture capital segment of Monsanto. Blue River has raised funding of $30.35 million and other backers include Pontifax AgTech, Data Collective, Khosla Ventures and Innovation Endeavors. Precision agriculture is farming practices that are reliant upon computer vision, smart devices and machine learning to improve their yield. It has become attractive to growers due to automating labor-intensive parts within the farming process, which allows them to lower their labor costs. It also reduces waste of water, fertilizer and pesticides. Precision farming is an important segment of the growth strategy of Deere and the company agreed to acquire Monsanto’s Precision Planting LLC in November of 2015, but abandoned that deal this past May after the Department of Justice filed a lawsuit over antitrust. The DOJ claimed the deal was actually worth $190 million and with Deere together with Precision Planting would hold 86% of the market for high-speed precision planting. Monsanto Growth Ventures was a participant in the $17 million Series B funding of Blue River, during December of 2015. Deere is Moline, Illinois based, and expects the acquisition of Blue River to be completed in October. The See & Spray equipment of Blue River uses machine learning and computer vision to help farmers to lower herbicide usage. Its cutting-edge technology is able to analyze each plant and then refers back to an image library to determine it’s a weed. If that is the case, the See & Spray will spray herbicide onto the plant, avoiding surrounding soil or the crop. This has distinguished the equipment from other weed detection computer vision based methods that analyze the growth patterns as well as colors of plants and makes the method far more precise. Other machines from Blue River include LettucBot, which culls lettuce automatically so the others have the space to thrive, and drones that are remote sensing. The CIT officer for Deere John May said Deere will integrate the technology of Blue River in a number of its products.